Home > Help & Advice > Installation > How do you use cat5 cable to wire a cctv system? 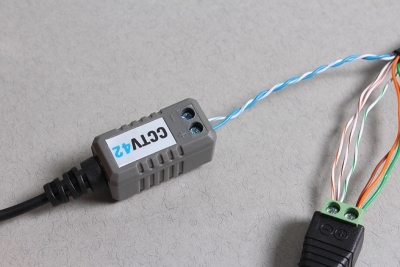 In recent years the invention of the video balun has meant CAT5e cable can be used to connect CCTV cameras to CCTV DVR recorders. All the connections can be made using only a screwdriver, no need for special tools or fiddly components. Before you start there are a couple of important things to know. Video is transmitted along the CAT5e cable using a pair of video baluns, one at the DVR end, one at the camera end. We sell 2 types of video baluns, Standard definition and High definition designed to be used with our HD 1080P cameras and DVR recorders. Power is transmitted using using screw in DC plugs and sockets. The plug goes at camera end the socket at the DVR end. Locate the camera power supply close to the DVR. You must use pure copper CAT5 cable . Some CAT5 cable is not pure copper but CCA or copper coated aluminum. Don't rely on the label or what the retailer says, actually check the cable yourself. 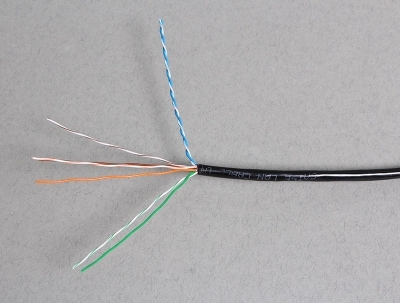 CAT5, CAT5e, CAT6 and CAT6e can all be CCA rather than pure copper. CCA tends to break easily when bent and you can scrape the copper off to reveal silver coloured metal in the centre. All the cable we sell is pure copper external grade. The maximum distance video signal can be transferred with our video baluns is approximately 300 metres. If you are using the cable to power a camera as well as transfer video signal then we would suggest a maximum distance of about 50 metres to avoid voltage drop. 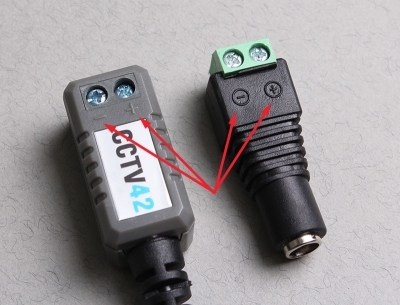 This assumes you are using 3 pairs of wire for 12 volt supply and 1 pair for video signal transfer as per our images below. It is important to check your wiring carefully. Choose a colour convention and stick to it. In the examples below we have used blue for video signal and solid colour for +ve, white plus coloured stripe for -ve. You need to run 1 length of CAT5e cable from the DVR recorder to each camera. The cable is going to do 2 jobs. One pair of wires will handle the video signal, the other 3 pairs of wires will be combined to take 12 volt power from the transformer located next to the DVR to the camera. Separate the 4 pairs of wires in the Cat5e cable. In this case we are going to use the blue pair for transferring video signal from the camera to the DVR. Keep this pair twisted, to reduce the chance of interference. The green, brown and orange pairs are going to be used to take 12 volt power from the transformer to the camera. We use 3 pairs of wires combined to reduce the risk of voltage drop at the camera. Having unwound the wire use the solid colour for 12 volt +ve and the white with coloured trace for 12 volt -ve. Here we can see the cables inserted into a video balun and a power plug. Remember to strip back the outer plastic sheath to reveal the copper conductor before pushing into the fittings and tightening the connector with a small screwdriver. Note how we have combined the 3 pairs of wires for the 12 volt DC fitting. 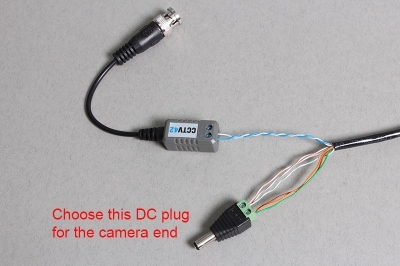 Be aware the DC power fittings are different for the DVR end of the cable and the camera end of the cable. 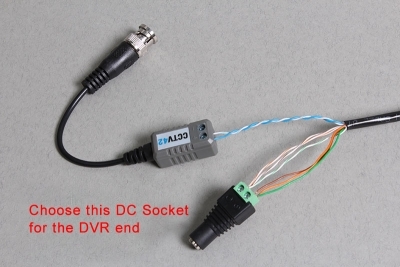 The DVR end requires a female socket to take the 12 volt power from power supply. It is important to protect the fittings from water so we recommend using weather proof junction boxes by each camera. All the components you need are available in the CCTV accessories section of our online shop.